Ok, so this question surfaced in our inbox, and while it isn’t uncommon to get emails asking for bag recommendations, a comparison between this pair was definitely an unusual one. For one, they are really very different, but when you only have the budget for one, it does come down to which one is best. Or does it? The bags in question? Céline’s Classic or Chanel’s Gabrielle. And while both hail from French luxury brands, that’s about it really, given how different both truly are, with each its own distinct shape and silhouette. But if replying this email is going to make it that little bit easier for you to decide (yes, you), here goes. Céline’s Classic is, as the name suggests, now a true classic piece identified by its signature clasp, a bag where you can tuck everything neatly within the inner compartments that’s covered by a simple (but elegant) front flap. It’s discreet, with no flashy logos, available in Small (16 cm by 13 cm) as well as Medium (25 cm by 18 cm), and comes in three types of leather. There’s boxcalf leather, which is a finer leather that’s smooth and carries a distinctive sheen. Calfskin Liégé, on the other hand, has a slightly grained finish that’s resistant to scratches and perfect for those who want a bag with a matte finish. And then there’s natural calfskin leather that currently is available in a single colour, Tan that’s finished with contrasting seams. If you fancy something exotic, the Classic is also available in croc, lizard and python, the choice is yours, really. Chanel’s Gabrielle, on the other hand, is more contemporary and created by Karl Lagerfeld. 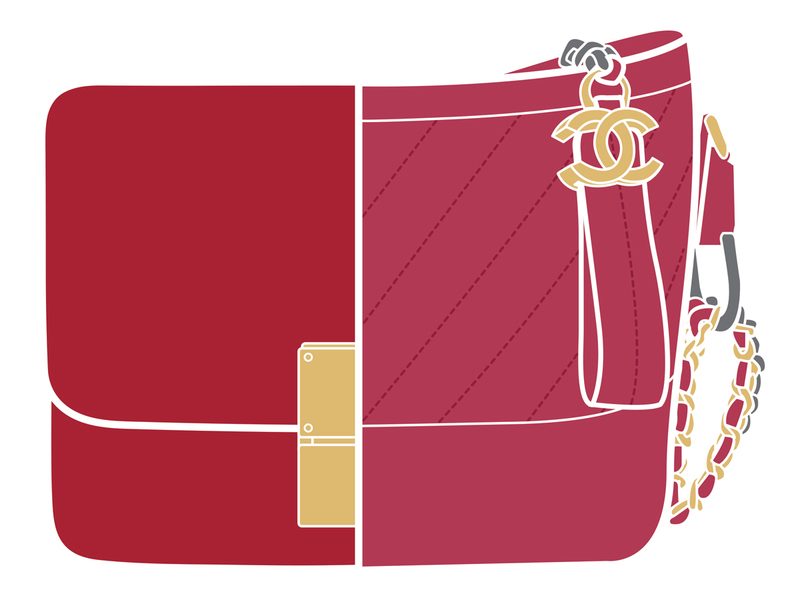 Named after the house’s founder, Gabrielle Chanel, it’s a bag that comprises several features all in one single piece. This includes the sturdy base, giving the bag added stability. The quilted leather body, on the other hand, provides a nice contrast and gives it a touch of character, especially for the ones that come in crinkled leather. As for the chain strap interlinked with leather, that’s pretty much Chanel through and through, and is also what gives the Gabrielle added versatility. Each bag comes with a long chain sling that’s adjustable to several lengths, allowing one to wear it one of many ways. Finished with a zip pull, the Gabrielle is a bag that’s a growing favourite amongst the fashion crowd, also in part thanks to the many sizes it comes in. There’s the Gabrielle Hobo (28 cm by 21 cm), Small Gabrielle Hobo (20 cm by 15 cm) and the Large Gabrielle Hobo. Besides the classics, it also comes in seasonal offerings, from PVC to shearling or tweed, as well exotics like alligator. And if you want to compare it on a 1:1 basis, the closest two would be the Classic in Small (SGD4300) and the Gabrielle Small Hobo (SGD5590), both of which are in full leather. Yes, even the prices differ too. One classic. One modern. Not at all the same, which just means it really boils down to what you prefer. What say you?